With Meghan Markle and Prince Harry's sure-to-be-rule-breaking royal wedding just a few weeks away (stay tuned with Who What Wear UK for live coverage of all the most important fashion intel), we're looking back through the history books to find clues about the all-important dress to come. On June 19, everything will become clear, but what if—bear with us—Meghan had seen Princess Anne's statement-sleeved gown from her 1973 wedding to Captain Mark Phillips and felt inspired to re-create a modern version? It is, in our opinion, one of the most underrated wedding gowns of last century (keep scrolling to check it out). When you come across the phrase "princess wedding dress," a big poufy ball gown probably comes to mind, right? Well, based on our research, the actual princess wedding dresses throughout history aren't always of the poufy ball gown variety—although there's a decent amount of tulle and underskirts to keep those of you who like a dramatic gown happy. 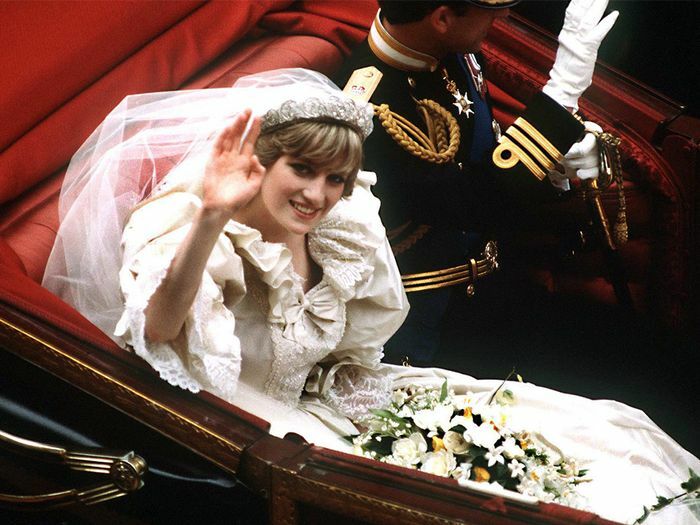 Princess Diana's wedding dress certainly put all poufy wedding dresses to shame (we'll refresh your memory below), but that was the peak of '80s extravagance, and many other royal gowns run the gamut from slim, lace, and long-sleeved to off-the-shoulder and satin. You're probably familiar with a few of the below (has anyone on this planet not seen Kate Middleton's dress a thousand times? ), but many of the princess-style wedding dresses included below are significantly more under-the-radar. Head below to see 24 stunning regal gowns throughout history, from 1925 via Queen Elizabeth II, Princess Grace of Monaco and many more up to now. Mafalda was noted to be wearing the Hesse family wheat tiara. Designer: Sandra Mansour (and you can read all about this beautiful gown with via our interview with the designer). Next up, the best high-street wedding dresses you'll love. This piece was previously published on Who What Wear U.S. and has since been updated.